Irkutsk-based carrier IrAero has taken delivery of its fifth Sukhoi Superjet 100 (SSJ100) regional jetliner, OEM Sukhoi Civil Aircraft Company reports. The aircraft was delivered under a contract signed between the airline and GTLK State Transport Leasing Company for four SSJ 100LR (long range) airplanes. The newly delivered SSJ 100, registration number RA-89075, was manufactured at the end of 2016, according to open sources. The cabin comes in a 100-seat single-class configuration, and can be rearranged into a two-class layout seating 93. 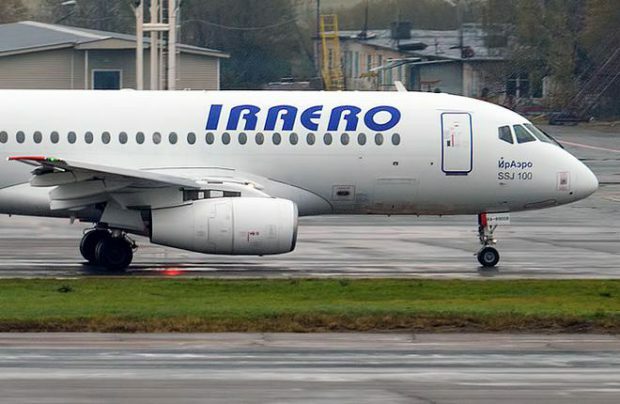 IrAero has told Russian Aviation Insider that it plans to operate its SSJ100s on routes from Irkutsk to Moscow, from Omsk and Irkutsk to southern Russia, and also to Southeast Asian destinations, including Vietnam, Thailand, and southern China. With the delivery of the new aircraft, IrAero’s SSJ100 fleet now stands at five airframes. The other four airliners were taken pre-owned from the Russian carriers Aeroflot and RedWings. According to the Federal Air Transport Agency, the carrier also operates three Bombardier CRJ200LR regional jets, six Antonov An-24 and seven An-26 turboptops.